EKU Danville’s Community Service emphasis includes working to restore the Shelby City African American Cemetery about 3 miles from our campus, just southeast of Junction City. The original cemetery was formed at the juncture of three large plantations on land belonging to Isaac Shelby, Samuel Warren, and George Givens. Slaves from these properties may have been buried here as early as the 1780s. 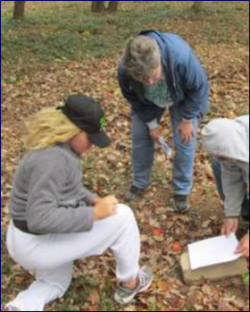 EKU Danville staff, students, and faculty have been working since October 2013 on this site, as have archaeologists, anthropologists, and students from Centre College. Each Saturday a group works from about 9:30 to early afternoon. Volunteers can count this service work on their co-curricular transcripts.